Mouse gestures are an extremely fast and easy way to navigate websites and web pages, and it's only natural that you'd want to be able to use them in other programs and to navigate your PC. Lifehacker has done just this, exporting mouse gestures to the domain of Windows Explorer and other Windows applications. You can use Rocker to gesture your way through programs like iTunes, Notepad++, Internet Explorer, and folders and files in Windows Explorer. For instance, hold a mouse button down and shift your mouse from right-to-left, and you'll move back a page in Internet Explorer. Do the opposite, and you'll move forward just like in Opera (as a standard feature) and Firefox (with the All-in-One Gestures extension). The same reasoning applies to tabs and Windows directory navigation. 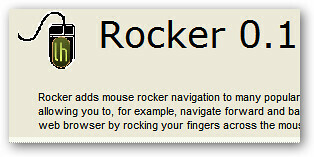 The handy thing about Rocker is that all you need is this one small program, and you won't need to install any additional mouse gestures programs or extensions.